This year starting from March till about now, I traveled a lot. When I traveled a lot I would crib because I was traveling too much, which would leave me very tired. Then for the past two weeks I have been at home. 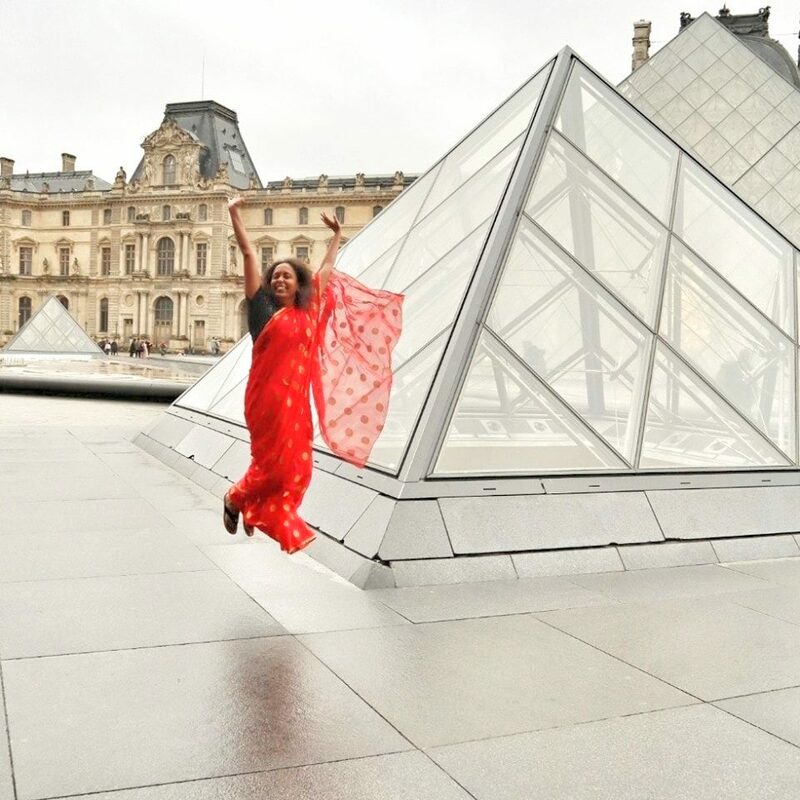 So, now I am getting nostalgic about traveling and then, you guessed it right, I crib again! So this is a nostalgic Skywatch Friday, featuring the Amman Citadel in Jordan. I visited Jordan in May 2014. 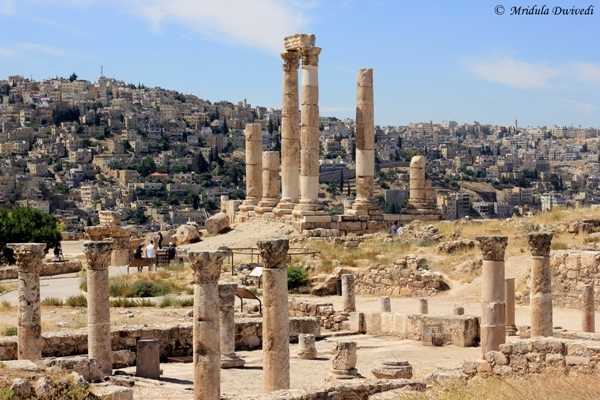 The Amman Citadel is ancient, said to be occupied since neolithic period. It is also known as Jabal al-Qal’a. One meaning of Jabal is a hill. 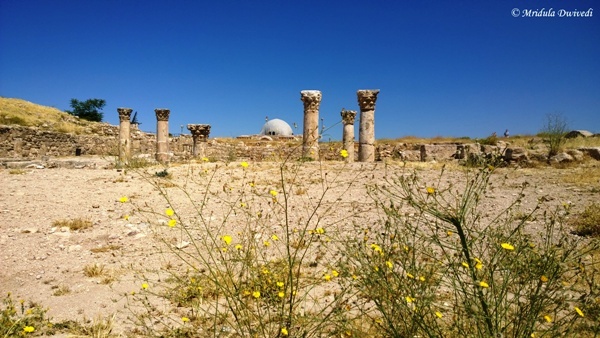 This citadel is on one of the seven hills which constituted the original city of Amman. It is said to have passed influence of three religions- Judaism, Christianity and Islam. 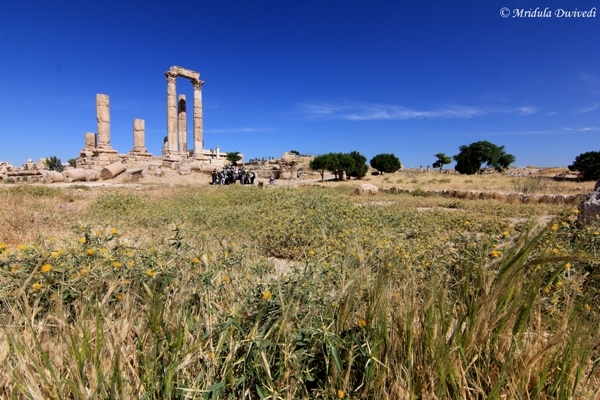 It is a popular tourist destination in Amman. The main ruins which you can see above is the Temple of Hercules. The citadel is spread in a vast area and has many places of interest. Jordan Archaeological Museum is within the grounds. Umayyad palace, a huge water tank and a mosque are other points of interest. Visiting this place would require some amount of walking. The view of the city from the Amman Citadel is quite impressive. The day we visited the place it was not too crowded. The weather was nice, we had clear blue skies and a nice breeze. The sun was happy to lord over the sky. As the place is quite huge it never felt crowded. Almost everyone climbed up the ruins to get photographed next to the pillars of the Temple of Hercules. I had left my zoom lens in the bus itself, as I never thought I would need it at this spot. Guess what? There were birds around the place and I did kick myself for not carrying the lens around. But that is a minor regret. Overall, it was a wonderful half day that I spent at the Amman Citadel. The Royal View Hotel, Hong Kong Are you a Foodie? Nice shots even thought you left the zoom at the hotel. Thank you Janice, I was missing the zoom as I saw birds in the area! You are right this is a classic travel paradox that we all face. I keep telling myself I will now rest and then come another weekend I want to make a plan all over again 😀 the pictures are great captures needless to say! Thank you Richa. Two weeks I have been at home and I am getting restless. Thank you Maniparna, I did miss the birds as I had no zoom. Beautiful sky. Great memory. You remember so many details of the place you visited three months before. Yes it is the tendency of mind to complain what we do not have. We never relish what we actually have. Abhijit I click a lot of pictures of sign boards so that I could use the details 😀 It is not all by memory. I missed the zoom because there were birds around! I think for landscape it would not make too much of a difference. As usual , beautiful post ! How wonderful! Visiting Jordan is on my list.